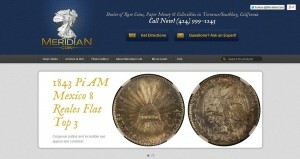 Meridian Coin address, phone, website, hours of operation, and more. After years of operating primarily as a wholesale dealer of numismatics, we realized that there is a definitive need for a professional “brick and mortar” coin shop in the South Bay to service a wide variety of clients wishing to buy and sell coins. Thus, in early 2012, Meridian Coin opened its doors to the public in the Farmers and Merchants Bank Center in Torrance, CA. We pride ourselves on our knowledge, market information and trade experience, and we offer that level of expertise to everyone we meet. Our numismatic experience includes assignments at a premier Beverly Hills auction house and at several national-level coin firms. We have first-hand knowledge not only of the rare coin industry, but also of the precious metals market, shipwreck numismatics, all US and World rarities, auctions and estate sales; we have helped countless enthusiasts and sellers reach their collecting and investing goals. 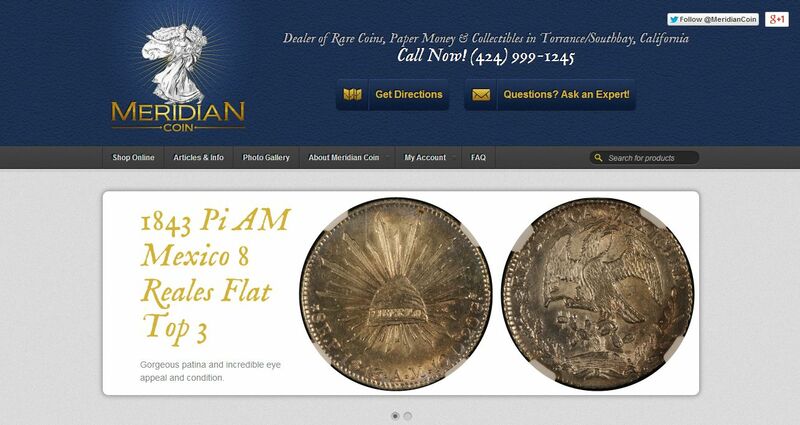 Contact Meridian Coin for ANY questions you have concerning coins or precious metals– our philosophy is to educate our customers. Every inquiry and transaction is treated in a courteous, professional manner. As numismatics and an interest in firearms tend to go hand-in-hand, after nearly 10 years of constant education and training and a lifetime of shooting, Meridian Coin has acquired an FFL 07 license to buy and sell modern and antique firearms as well as to build and repair the AR platform system. Contact us to learn more about Meridian Coin’s firearms transactions. Please check into our website frequently for updates to inventory and for informative articles on numismatics and related financial news. Be sure to visit our storefront and always get our appraisal or offer before making a decision about where to buy or sell your coins. We look forward to doing business with you and we hope that we can all share in the excitement that surrounds the buying and selling of rare coins, precious metals and the rarities of our past and future.